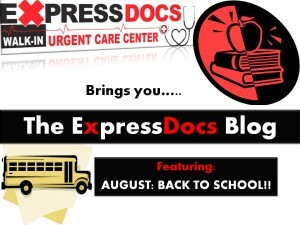 Home › The ExpressDocs Blog › Health Awareness Initiative › August is Back to School Month! The school supply aisles will be packed this weekend with last minute shopping before school reconvenes for many on Monday, August 18th! Don’t forget to fill your shopping carts with notebooks, pens, pencils, rulers, and most importantly healthy snacks to start the school year on a high note! Some great healthy snacks are apples, bananas, oranges, carrots, peppers, cucumbers and any other fruit or vegetable your child enjoys! Many schools require your children to receive school physicals from a physician. ExpressDocs is open this (and every) weekend from 9 am – 4 pm so walk in at your convenience and get that school physical completed! We also offer Tdap for those students entering 7th grade this year. If you need a sports or college physical, walk in to ExpressDocs! For the safety of your own child and all children in the classrooms, it is vital for all required immunizations to be up to date. There are many infections and sicknesses that are difficult to control and prevent the spreading of, but for those diseases and infections we can avoid we must do everything in our power to meet the standard health regulations and protect ourselves from avoidable diseases. Teach them to wash their hands frequently, particularly if they feel they may have touched someone who has been sneezing and coughing. Teach them to hold their mouths when they sneeze and cough to prevent the spreading of their germs. Teach them good hygiene, including always washing their hands after they go to the bathroom. Encourage them to get involved with team sports. Involvement in organized sports is great for your child’s social health as well as their physical health. Encourage them to participate and take advantage of recess and gym. Teach them the importance of physical activity. Physical activity will make them not only feel better during the day, but sleep better at night. Enforce good sleeping habits. Sleep is a time for the body to recover from the day and is vital for healthy functioning. The National Safety Council has other great safety tips for children going back to school.